First off, this isn't a sponsored post; I'm just really excited about Stitch Fix! It's pretty magical. "Oh hey, let me just pin this really cute outfit that I wish could appear in my closet soon!" Oh wait, that can really happen? 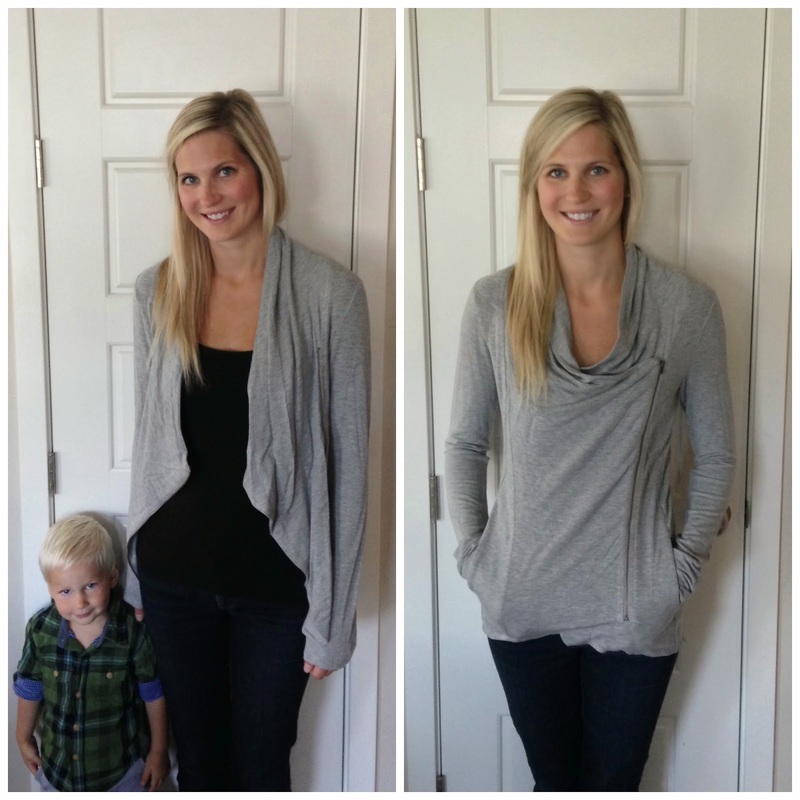 Yep, I literally pinned this sweater shortly before my stitch fix shipped and it was in my box! I didn't realize how much your stylist will consider your Pinterest board, so I will definitely be pinning plenty more outfits before my next fix arrives! I have been interested in Stitch Fix for awhile, but I only recently pulled the trigger and finally signed up! Since having Liam, I rarely shop for myself; therefore, my wardrobe has suffered a bit. Something about wrangling a toddler into a dressing room just isn't that appealing (especially when he's constantly peeking under the doors at the other women). Plus, I tend to have sever buyers remorse, so I am not one to make quick decisions. Stitch Fix is perfect for me! I joined with the thought of getting a shipment once a month and just keeping my favorite item from each fix. I'm considering it my little monthly splurge! Here's what I received in my 1st fix. Please note, I hate taking pictures of only myself...and then modeling clothes, ugh! So forgive how unnatural I look in all of the photos! 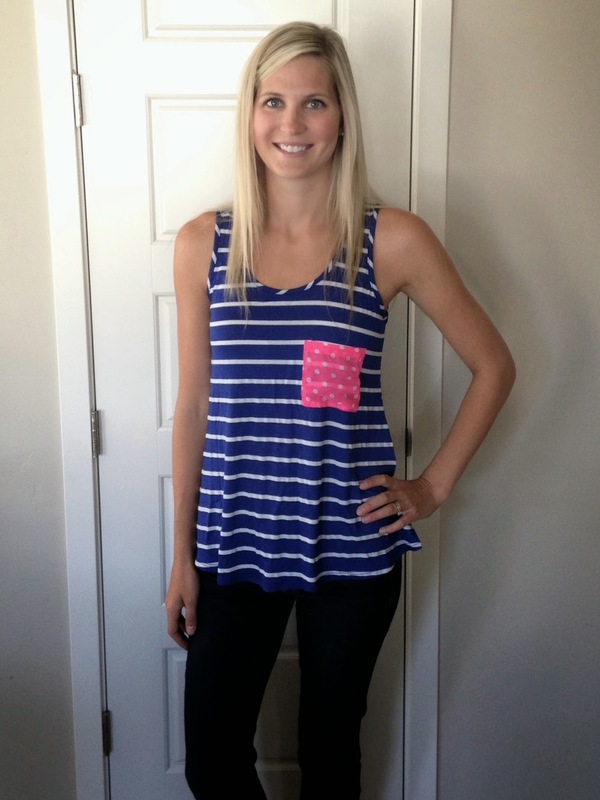 Contrast Pocket Striped Knit Tank: liked it. Raglan Striped Knit Shirt: perfect fit, hated the style. Scoop Back Hi-Lo Knit Shirt: it was okay. French Terry Asymmetrical Zip Cardigan: LOVED & KEPT! Distressed Boyfriend Jean: hated them. I've heard that each fix only gets better & better as your stylist learns your taste. 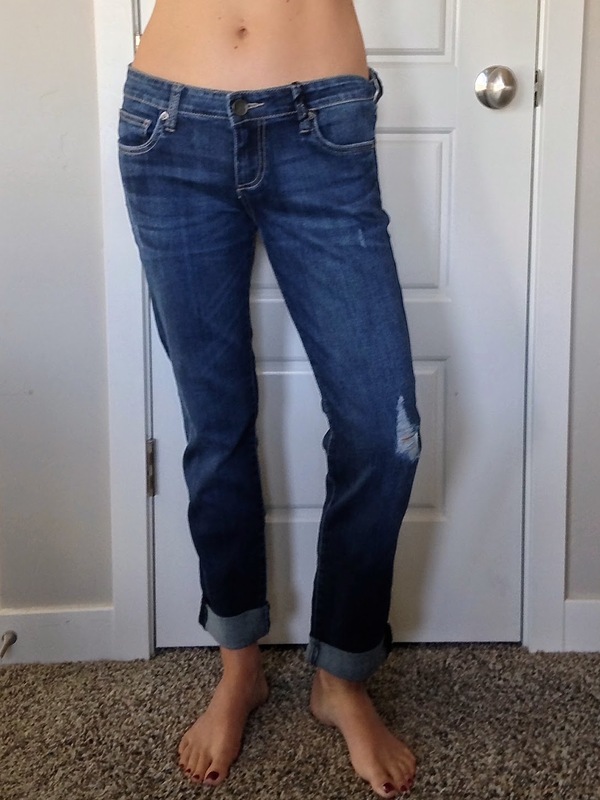 I'm hoping for some fall staples in my next fix! If you want to try it out for yourself, do a girl a favor and use my referral link! I will thank you for days! Love that grey, it looks perfect on you!!!! And those jeans -your little tummy!! I've heard good things and eh things about Stitch, so I haven't taken the plunge yet. I do like that grey top you kept, super cute. You are so cute, so everything looks fantastic on you! I really do love the last top too! It's so versatile! LOVE the gray sweater! Love how you can wear it open or closed! I've seen so many people posting about Stitch Fix. I've been so bad about buying myself new clothes since I've had Mason too. Which is bad because I just wear the same thing every week to work. And I think they're starting to notice! LOL. Maybe I will have to look into it! oooh that sweater is perfect! love it. i also like the jeans but understand that you hated them. i have tried for years and distressed boyfriend jeans do not look good on me, though i keep trying. Fun!! I love when other people do this and seeing what they get. :) The cardigan is perfect, I loooove asymmetrical ones like that. How do you feel about the quality of the clothes? I've never heard of Stitch Fix before but I love the idea! That zip cardigan looks sooo comfy but still cute! Such cute pieces! I will definitely be looking into this after Stella is born! yeah that second top, kind of odd. I really like the center bit though, just not the rest. Anyways...that grey cardi is amazing! I hope your next box is better, and keeps on getting better! Oh man that gray sweater is fabulous! I love it! 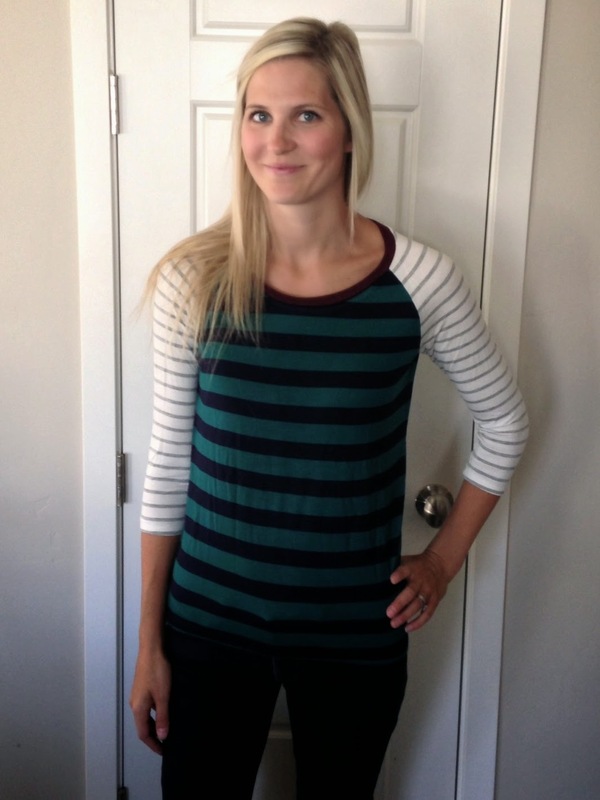 I love me a good baseball tee, so I love the striped shirt! That's definitely something I would have kept :) but thats the great thing about Stitch fix! Too funny... I just got my first stitch fix and I got the same gray cardigan and distressed jeans! I'm keeping the cardigan and returning the jeans!